I am not vegan. I love meat, I love eggs, and I love cheese, and even better meat + eggs + cheese. That said, I love eating vegan and vegetarian foods — I mean, for reals, I *AM* from Eugene, Oregon, which happens to be the capital of hippy and vegan living. I also love experimenting in the kitchen — especially with vegan recipes. 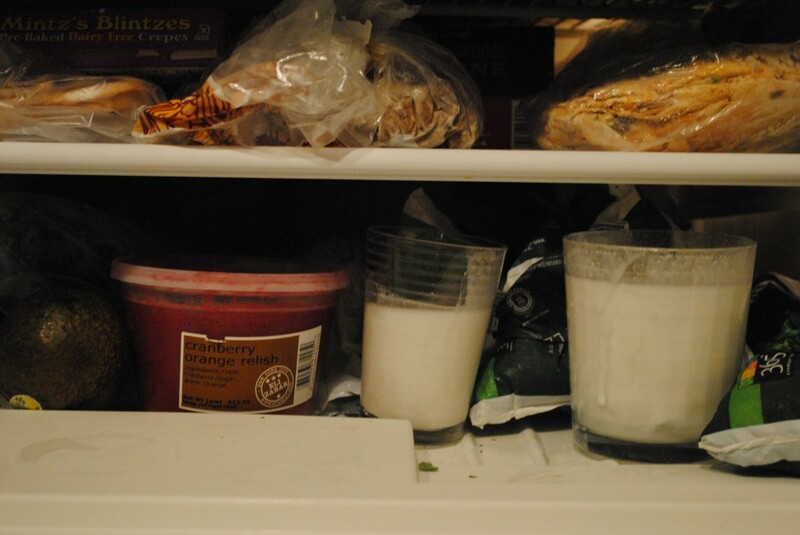 So, it is not unlike me to try to make vegan egg nog…. I actually really enjoy — love, actually — this version of egg nog (I always love my creations: avocado chocolate mousse… negative calorie pumpkin pie… spinach brownies — all healthy and rich). My husband? Not so much (but he never really likes any of my creations, unless they are actual recipes — which is a rare event these days). Most vegan egg nog recipes have silken tofu in it, and although I like tofu, I am also convinced that soy actually gives me stomach issues (along with a handful of other foods). So this recipe that I found has NO tofu in it, which was exciting (to me). This recipe is from a cute blog called Post Punk Kitchen. It is a healthy, simple, and straightforward vegan cooking blog that I like to browse for recipe ideas from time to time. And the best part about this recipe is that it uses avocado and coconut milk, both of which I love. Even though egg nog is a dessert (I think of it more as a dessert than a drink), it is a healthy dessert because anything with avocado and coconut is HEALTHY!!!!! The bizarre ingredients involved in this egg nog make it so tasty! Trust me! You want all the ingredients to be COLD. Nothing worse than luke warm egg nog. So, in order for the egg nog to be the tastiest, all the ingredients need to be very cold. First, put the coconut milk and the avocado in the freezer for 30-45 minutes (obviously, first take the coconut milk out of its aluminum can and into another container). The coconut milk and avocado in the freezer. Totally ghetto. Ignore the messy freezer. 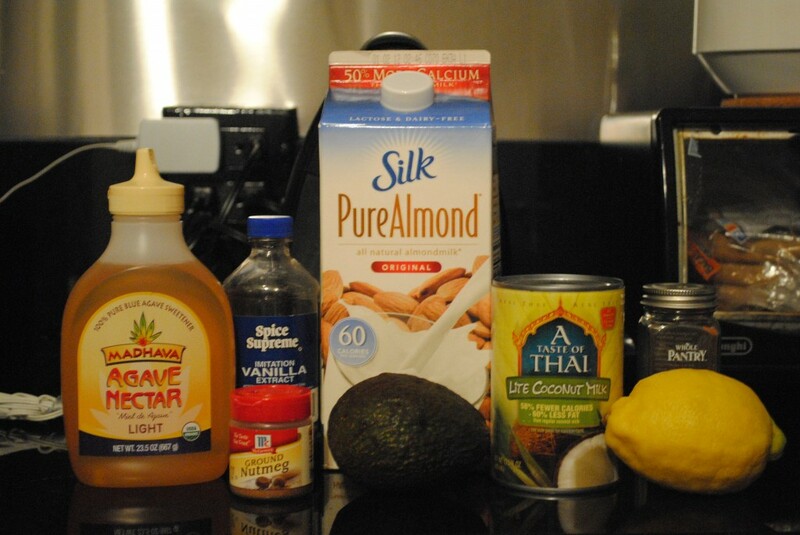 Then, put the almond milk, coconut milk, all the other ingredients, and the sliced uber cold avocado in the blender. 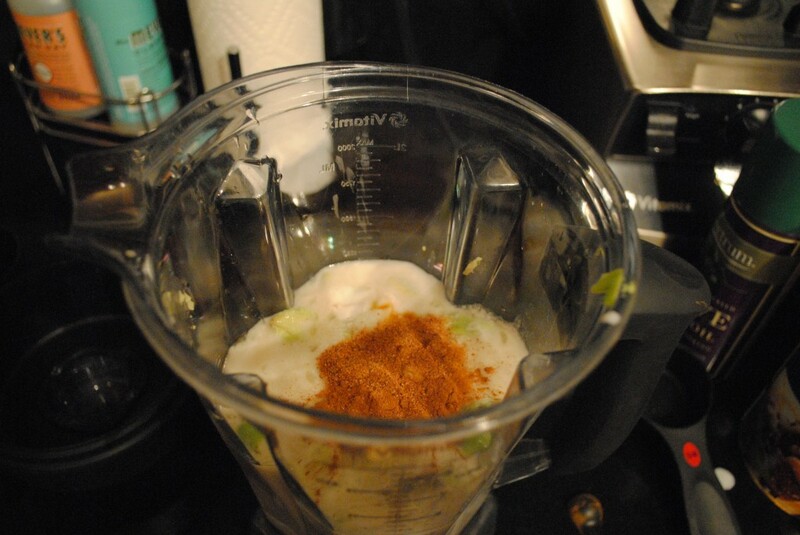 BLEND for a while — you want the egg nog frothy and well blended. Nothing good about being served egg nog and realizing that there is a big chunk of avocado in your drink. And voila, tada! VEGAN EGGNOG! In the blender about to get its frothin' on! I know there are people who will not try to make this recipe because the ingredients sound a little unappealing, but TRUST ME. This recipe is absolutely delicious. Swear to God. Scout’s honor. MAKE IT. I promise you will not regret it! HIP HIP HOORAY! VEGAN EGG NOG! For those of you who are still skeptical about this concoction, my son is the pickiest eater in the world. 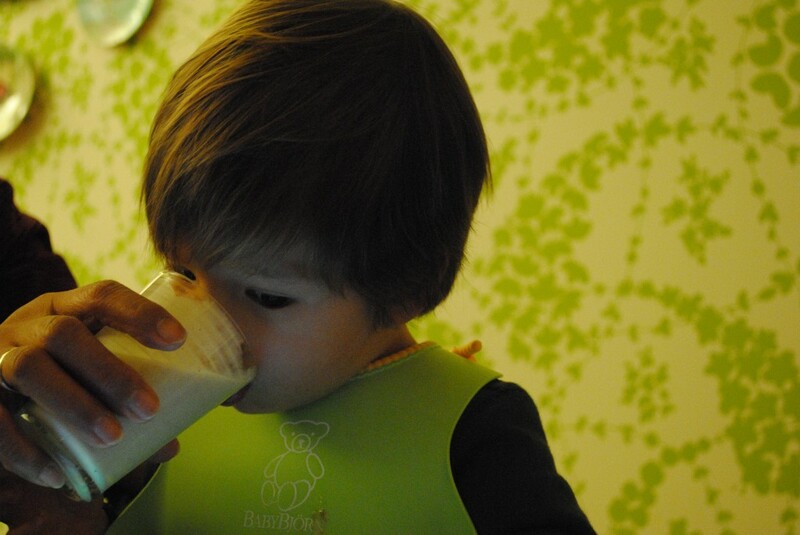 We basically have to force feed him to eat, and he gulped the entire glass of egg nog and even asked for more. Dead serious. Not one of my normal exagerrations. It is that good. This definitely sounds a little weird, but I am going to give it a shot. I will be sure to let you know how it turns out. The only thing drawing me to it (outside of the healthy part) is that your son looks like he is enjoying it! Have a great weekend! your freezer needs a little more love.. ha ha! Hey, Love this! 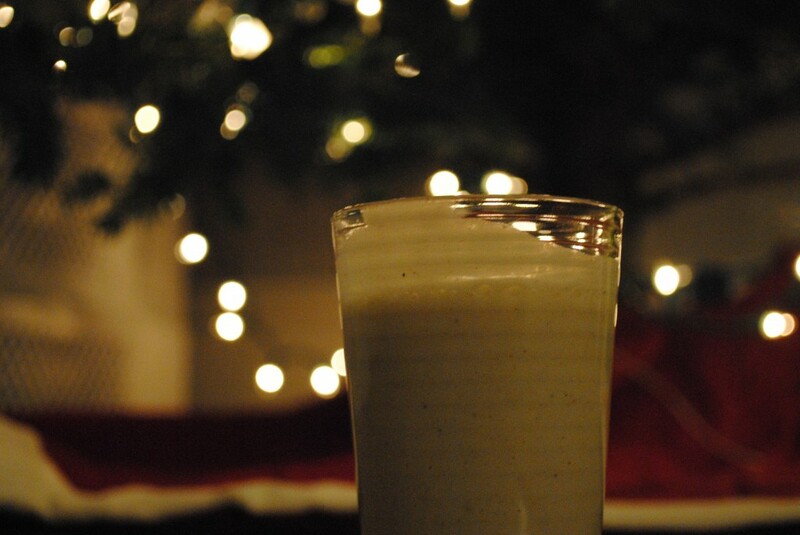 I have a vegan eggnog recipe too that’s a little different and NO TOFU or SOY! I am a vegan chef and I love Post Punk Kitchen! Check out my recipe as well and see what you think!! http://www.yogamint.com/_webapp_4104507/Celebrate! Thanks so much, Melissa! I looked at your recipe and they look very similar — but I love the addition of the date paste and the cashew creme. Will definitely have to look into making this with those two additions! Thanks so much! !